Field days are the best. They take up a good portion of the work day, they involve going out on the water, and they are more fun than sitting in front of a computer and drinking your weight in coffee. Yet, as I’ve learned, while there are weeks with numerous field days, there are also long days that consist of sitting at the office and looking at a computer. This is what my week six consisted of. Although while sometimes I watched the minutes tick by, there were times where I really enjoyed working with the data that we had collected, while in the office. This week I was able to take data collected from long lining, (one of the surveying methods used in the Marine Reserves), and use ARCgis to map where fish were taken up and what species they were. This was a tedious process, but very satisfying once I was able to put the map together. Another reason I enjoyed this was the fact that this was one of my goals I wrote at the beginning of the summer. I now feel like I have a better grasp on using ARCgis and really enjoy using it as well. While the week consisted of a lot of sitting, I learned a lot and am chipping away at some of my goals for this program. While work takes up a good chunk of the day, some of the shenanigans we get into after we get back to Hatfield can turn the most boring days into fun. Thursday night we decided it was time to test our vocals and hit up Hoovers Bar and Grill for some Karaoke. It took Rosalyn and I some time, but we decided on ABC by the Jackson 5. We quickly learned that we both did not possess the skill to reach the pitch of that of a ten year old Michael Jackson. It didn’t matter though. We killed it anyways. As well, this weekend was relaxing and a ton of fun. On Friday we explored the Yaquina Head State Park and wandered around the lighthouse. Saturday, I was able to go to one of my good friend’s wedding in Eugene and today I went diving in Florence! It was an action packed weekend and I am very much looking forward to my next week of adventures! It’s already the end of week two and I can’t believe that next weekend is the fourth of July. I also can’t believe how tiring it is having a real job. I don’t think I have slept so soundly in my life. Even on the days where I’m not that mobile, I come home drained and starving for dinner. My coffee intake has increased even more than normal (which I did not think was possible), But all around I am really enjoying my work! This week turned out to be more challenging and required a few more trips to the local coffee shop than normal. We started the week the same way we ended the last by scoring more videos and identifying fish species from the lander videos. It was oddly calming doing this Monday. I sat in the “video” cave to score while listening to classical music with Steve the video guy. I actually thoroughly enjoy scoring videos and wish I could do it a little more often than I have gotten to. It’s helped me to learn to identify many of the Oregon fish species, and now I know what to look for when trying to pick them out. It’s a fun process and can be nice in the mornings when you are still tired and need to just sit and relax for a bit. The rest of the week I worked with a lot of GIS. I have VERY little experience with it so I was a little intimidated when they first said they wanted me to use it. Much of the week was working with GIS and they are hoping that in the next couple weeks, I will be able to use it with the hook and line surveys that are used to monitor the marine reserves. It should be fun and I am looking forward to gaining a useful skill. Another survey used is SMURFing (not the little blue men). This is an acronym for this method and unfortunately the full name is escaping my mind as I write this post… These are plastic nets that are used to collect fish larvae and measure recruitment in certain areas. They are collected every two weeks from locations within marine reserves and control areas off the Oregon Coast. I am very excited because I am able to participate in setting SMURFS and collecting ones that have been set out already. This means I will be able to dress down in full wetsuit and jump in the ocean to retrieve them. I am stoked to finally be doing field work. It is something to look forward to and I’m pumped to being using my snorkel gear this summer after all! As for the weekend, the OSG scholars are taking Portland! So far we are planning to go to the Saturday market and hit up some of the food carts and then hiking on Sunday. It will be an action packed weekend that will consist of a lot of food, beer, the outdoors and fun! Hopefully I will snap some good pictures to post for next week. As for now, the bed is calling my name and I am going to answer. I hope to have some good stories for the following week. Until next time! Let the Summer O”FISH”ally begin! My first week as a Sea Grant Summer Scholar is now finished and I don’t think I could have asked for a more overwhelming, fun, and exciting start. 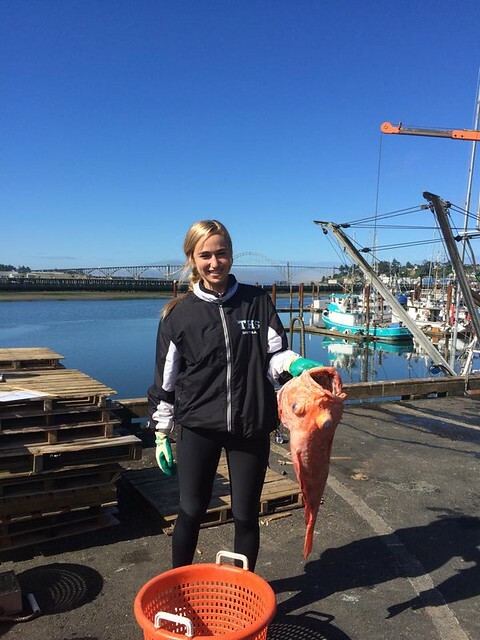 On Monday the 15th, I graduated from the University of Oregon and on that very next day I was studying fish species at the Hatfield Marine Science Center in Newport, Oregon. Needless to say the week has been a whirlwind. Now that life has calmed down a bit, I feel like it will be easier to relax and explore the new area that I am in. I have never spent a summer in any place other than Portland (where I am originally from) so I think this will be a breath of fresh air and a great new adventure. For the Sea Grant Program, I am currently working for the Oregon Department of Fish and Wildlife on the Marine Reserves Ecological Monitoring Project. 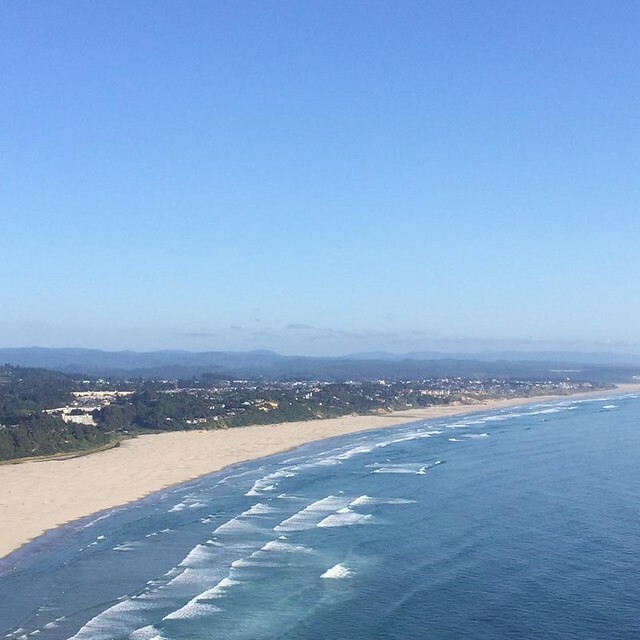 While I do not know exactly what the summer will bring, I am excited to be working with marine reserves which are a relatively new management option in Oregon. I am working on the same project with an REU scholarship recipient named Sara and am enjoying having a partner in crime. So far we have been learning a lot of the near shore fish species off the Oregon coast that we will potentially see in the marine reserves. All I’m going to say is I never I thought that I was done reading scientific reports when I graduated college. Unfortunately I was very wrong. It’s not too terrible though. We did get to tour the Oregon Coast Aquarium and are set to snorkel in the tanks sometime next week to sharpen our identification skills. Other than that, we have been learning to cut and score videos that are placed in the actual marine reserves as well as control areas via landers. These are basically anchors that are placed in the water with three different Gopro cameras attached and record the fish that are present in the area. Scoring has been fun but can be very tedious and the idea of fieldwork sounds more and more appealing for the following weeks. 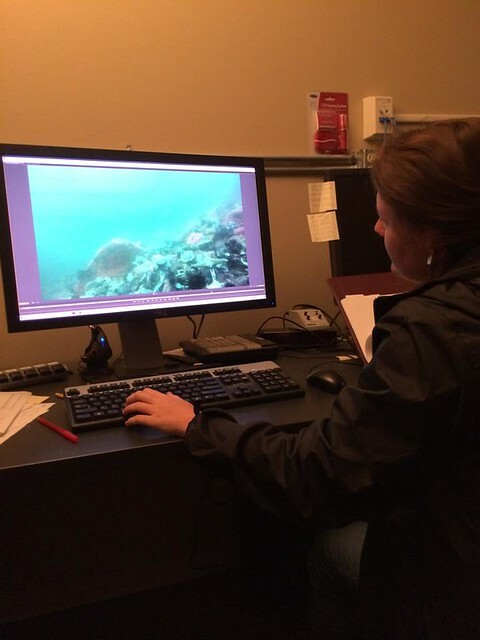 Since I do not have a specific project that I am assigned, our supervisor Brittany has said she would like me to dip my toes in a couples different areas to get the feel of what they do on the marine reserves team. These include, sampling intertidal plots for sea star wasting disease, some GIS work for hook and line surveys, and helping to score fish lander videos. Something that she wanted me to do while working on these things was to film these experiences on a Gopro and potentially use the videos for advertising. I am beyond excited to do this and love that I can take my Gopro out in the field. All around, the week has flown by and I cannot believe that it is already the end of June. Newport seems to be a gem of a town and a far cry from the bustle of Portland where I am originally from. I am looking forward to the experiences that will come from this internship as well as living in a new place with new people that are passionate about the same things!